Marinated tuna and mackerel chunks. 4 How Do I Pan Fry Fresh Fish With a Little Oil and Cornmeal? Fish contains little fat and plentiful protein, but when it's dunked in batter and submerged in hot oil, its status as a healthful food takes a hit. Breading and deep-frying isn't the only way to make a fish fillet delicious. Marinating fish contributes to flavor but adds few calories to the finished dish. Unlike marinades for red meat and poultry that typically soak for longer periods, fish marinades generally incorporate lighter flavors for shorter soaks. Tailor your marinade flavors to the fish you're using. 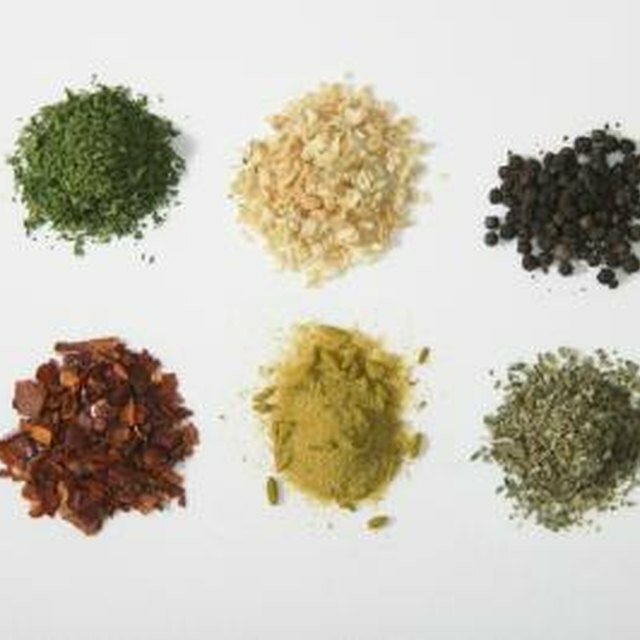 Decide on your preferred flavor profile before you mix your marinade. Mild white fish such as catfish or trout takes a more delicate marinade of light citrus juice or white wine with a dash of thyme or basil, while a more robustly flavored piece of tuna or salmon stands up to briny soy sauce or apple cider vinegar. Combine a mildly acidic liquid with olive oil in a ratio of 5 parts liquid to 1 part oil and place the ingredients in the plastic bag. If you're using a strongly acidic juice such as lemon or lime, dilute it with a weaker acid; otherwise the strong acids will denature the proteins in the fish before it hits the pan. Marinades are largely a matter of personal taste, so dip your finger in the marinade mixture before you put the fish in the bag to sample the balance of flavors and correct it to your liking. Spice the marinade with whole or cracked spices of your choice. Black or green peppercorns, bay leaves, rosemary sprigs, fresh or powdered ginger and cayenne pepper are some possibilities for flavoring your fish. Taste the marinade again and modify the spices to your taste. Add the fish fillets or steaks to the bag and press out as much of the air as you can before sealing the bag. Removing the air ensures that the fish has as much contact as possible with the marinade. Set the sealed bag in the refrigerator for at least 20 minutes and no longer than 1 hour. Heat just enough olive oil to cover the bottom of the skillet over high heat. If you're using a nonstick pan, turn the heat to medium; temperatures above 500 F can affect the finish on nonstick cookware. When the oil becomes very liquid, it's ready for the fish. Remove the fish from the marinade and shake away any excess moisture that clings to the fish; this will cut down on popping as liquid hits the hot oil. Lay the fish fillets in the skillet without crowding them and cook them for 3 to 6 minutes, depending on the thickness of the fish. Thicker fish requires a longer cooking time. If the fillets still have their skin, cook them skin side up first so the fish will have a deliciously crisp skin. Flip the fish using a spatula or kitchen tongs and cook for an additional 3 to 5 minutes or until you see that the fish has turned opaque throughout its thickness. Move the fish to a serving platter or dinner plate and garnish with a lemon wedge or sprigs of fresh herbs. Unlike meats and poultry, fish doesn't need to rest after cooking, so serve marinated fish immediately. A meat thermometer can help you gauge doneness with thicker fillets and steaks; fish cooks at around 145 F, so check for that temperature in the center of thick portions. If you're pregnant or are serving fish to young children, avoid fish that may have high levels of mercury. Smaller herbivorous species like tilapia and omnivores like catfish have lower concentrations of mercury than large predatory fish such as sharks, swordfish and tuna, so enjoy the former species more often.